And so the nightmare that summarises the Culture of Fear reaches the shores of Denmark. Two political parties announced yesterday that they will push for a bicycle helmet law for under 16s. A proposal was defeated in the Danish Parliament back in 2009, when rationality was still something politicians possessed, apparently. 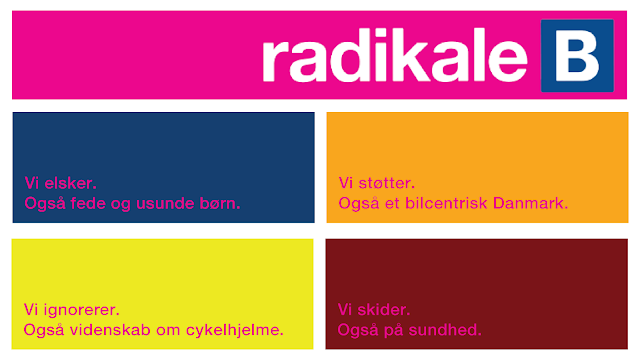 Danish readers can check out Cykelhjelm.org for a crash course in knowledge. "We are of the opinion that we must make our children as safe as possible when they are in the traffic". What the Radical Left and the Socialist Peoples' Party AREN'T doing is making our streets safe. They are NOT proposing to follow in the footsteps of over 80 European cities and creating 30 km/h zones in densely populated areas or proposing traffic calming measures in our cities. They are NOT proposing motoring helmets, despite evidence that they would be a good idea. They are not listening to warnings regarding bike helmet promotion or laws. Nor are they worried about the warnings from Sweden regarding children and reduced cycling. They are NOT telling us how they will keep children safe on playgrounds or in cars - where the risk of head injury is higher. They are NOT proposing restrictions or penalities on parents who transport their children inside of cars, what with the higher levels of microparticles than on the bike lanes that run parallel. The Radical Left are about as informed about helmets as the Socialist Peoples' Party are. We posted about the gaffes made by Pia Olsen Dyhr a couple of years ago. Little has changed in their lack of respect for science or just basic facts. Here's what happened in Sweden when helmets started being promoted and then legislated. It's the same thing that happened in so many regions that have been subject to the same anti-cycling wave. 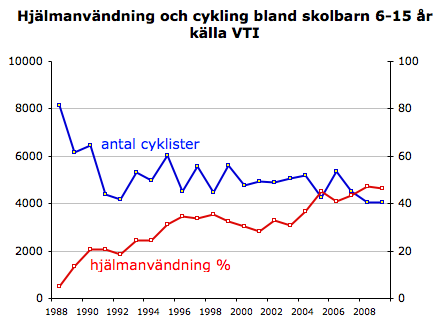 We wrote about this graph here a few years ago and there is more on this graph in Swedish here. The sad fact is that Copenhagen is the only city in the western world where cycling levels are falling. We're now at 35%, according to the City of Copenhagen. Before bike helmet promotion started in January 2008 we were at 37%. We predicted this back in January 2009. Our only bicycle advocacy group, the Danish Cyclists' Federation (DCF) are now busy telling the press that they are against the law. 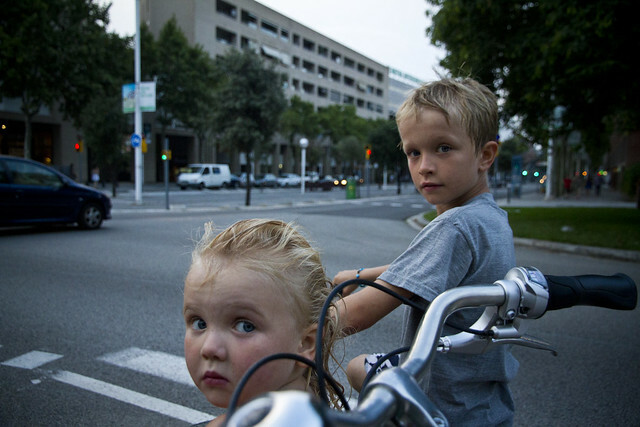 This has been their position for some time, but that hasn't stopped them from projecting their personal fear of cycling onto the population at large through intense helmet promotion, together with their rich and equally uninformed uncle, Rodet for Sikker Panik (Danish Road "Safety" Council). It's tragi-comic to see how they now have to employ all the arguments that the rest of Europe uses to fight against helmet promotion and legislation. But it's an organisation without any scientific staff - unlike the cyclist federations in so many other countries. They have made their bed and now they must lie in it. They Culture of Fear regarding cycling in Denmark is their work, along with the Road "Safety" Council, so this development is, indirectly, their fault. Without their pornographic obsession with helmets, we wouldn't be here today. I wonder where this will lead. Can the European Cyclists Federation help? As they have done in so many other countries that have defeated helmet laws?